It’s Food Revolution Day today! So I thought I’d jump on the bandwagon and post a recipe. Unfortunately I’m not doing anything educational with children today (apart from more thesis work, which is related to children and food education!) but I figured an easy recipe that can be made quickly and is superbly delicious sort of fits the bill. If you want to find out more about the day, head over to the Food Revolution Day website – there’s loads of information and ideas. 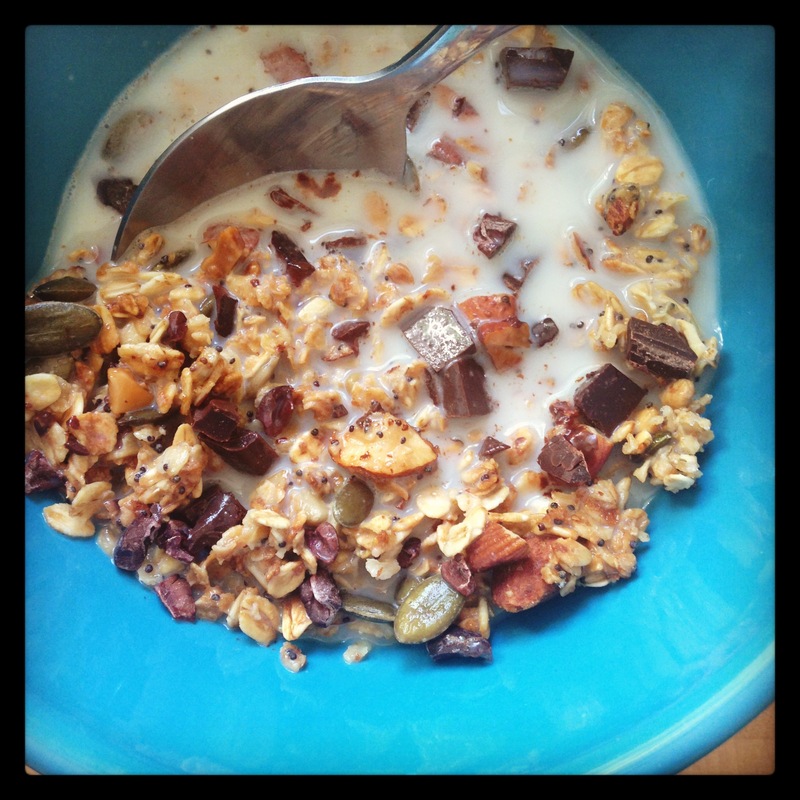 But now we need to talk chocolate granola. I’m a fairly boring breakfast eater on a day to day basis. I go through stages of eating the same thing, day in, day out. Sometimes it’s cooked oats. Sometimes it’s an apple with yoghurt. Sometimes it’s a quick version of bircher muesli (basically oats soaked in milk with additions depending on my mood). If I’ve made sourdough then it’s toast. On fast days it’s normally vegetables with an egg or more cooked oats. So I decided over the recent holiday that it was time to mix things up. Summer is coming! Cooked oats is too much faff when it’s warm. And often I need to dash into the office early and need something quick to eat before I go. 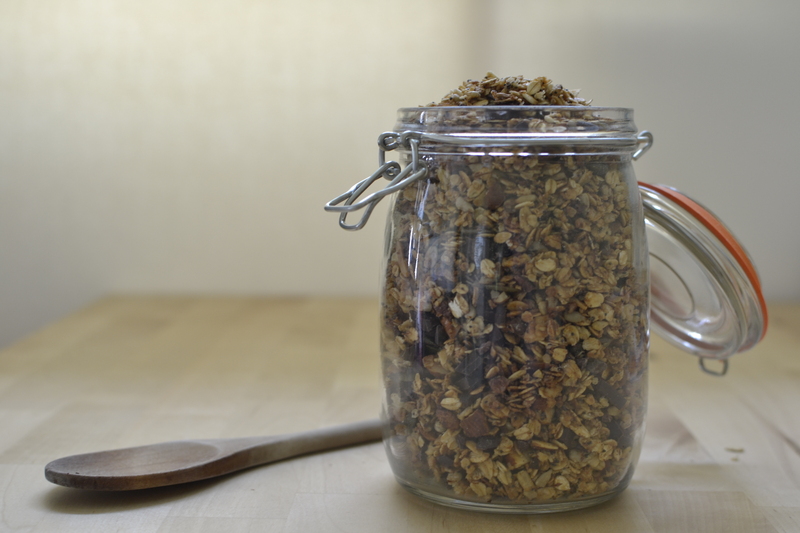 This granola is the answer. Feel free to adapt the recipe below as it pleases you. Play around with the sugar/honey/maple syrup combinations. Add or subtract seeds and nuts. It took me less than an hour from setting out the ingredients to eating breakfast, so there’s no excuse not to make your own! Happy Food Revolution Day! In a bowl combine the oats, almonds, seeds and sugar – give everything a good stir. In a pan, heat the sunflower oil, maple syrup and honey until the honey is loose and the whole mixture is very fluid. Pour the liquid onto the oat mixture and stir until everything is well coated. Distribute onto the baking tray and bake in the oven for 20 minutes, giving everything a good stir after 10. Keep an eye on the granola, you want it nicely toasted but not too dark. Once cool, stir in the chocolate and cacao nibs. Eat! (With milk…) And store in an airtight container.